Objective: To evaluate the association between body mass index (BMI) and oral health status among elementary school children in Hyderabad, Telangana, India. Materials and Methods: This cross-sectional study was conducted among elementary school children selected from government, private-aided and private-unaided schools in Hyderabad. A stratified cluster random sampling technique was used to select study participants. All parents were requested to be personally present on the day of examination. All eligible children were assembled in a hall and their height in inches and weight in kilograms were recorded by two calibrated investigators. The oral health status of children was assessed using a predesigned oral health assessment proforma. Plaque status was assessed using Sillness and Loe plaque Index and caries using decayed and filled teeth (dft) by a trained and calibrated investigator. Results: One hundred and seventy-one children (89 males and 82 females) were included in the present study. Mean plaque score was 1.4 ± 0.6 with no significant difference in the mean plaque score between children in three different categories of nutritional status (P = 0.07). Mean dft among primary teeth was 1.1 ± 1.1 with a significantly higher score among children who were malnourished (2.4 ± 0.9) compared to children who were overweight (0.9 ± 0.9) and normal (0.4 ± 0.6) (P < 0.001). Conclusion: BMI was negatively associated with caries experience in primary dentition with no association with plaque scores. Overweight children with malnutrition had significantly higher caries experience compared to children with normal BMI. On the other side of this nutritional imbalance, childhood obesity is currently one of the most common health problems in numerous countries, attributed to eating habits and sedentary lifestyles, which can lead to a high prevalence of non-communicable diseases such as diabetes, hypertension, and cardiovascular diseases. Evidence suggests that dental caries have a positive association with obesity. Literature also suggests preschool children with a low body mass index to be at significantly higher risk for dental caries while some studies found no association between childhood obesity and dental caries. Oral hygiene status, which is one of the predisposing factors for dental caries, was found to be poor among government school children compared to private school children in a study conducted in Andhra Pradesh. Prevalence of dental caries was also high among government school children who had poor nutritional status compared to private school children in this study. Preceding discussion on the relationship between nutritional status and dental caries suggest that malnutrition which could manifest as either malnourishment or obesity on either extremes of nutritional status can both lead to increased risk of dental caries.,,,,,, However, literature is divided on this relationship with a few studies finding no such relationship. Moreover, literature evaluating the association between body mass index and oral health parameters among Indian pre-school children is scanty. Hence, the present study was undertaken to assess the association between nutritional status and oral health among elementary school children in Hyderabad, Telangana, India. This cross-sectional study was conducted among elementary schoolchildren selected from three different schools in Hyderabad, over a period of six months from November 2015 to April 2016 at Osmania Dental College and Hospital, Hyderabad. Ethical clearance was obtained from Institutional Ethics Committee, Osmania Dental College and Hospital, Hyderabad vide reference number GDC and H/PHD/0018/2015. Permission to conduct the study was obtained from the concerned school authorities after explaining the research protocol. Informed consent was obtained from parents of selected school children through an information sheet communicated to parents through the school system. A stratified cluster random sampling technique was used to select study participants. A list of all elementary schools in Hyderabad was obtained from the district education department. Schools were further stratified into government, private-aided and private-unaided schools. One school each category was selected using lottery method. All elementary school children aged 3–6 years who fulfilled eligibility criteria were considered for the study. Children cooperating for clinical oral examination. Children absent on the scheduled day of visit. Dates of visit to each school were scheduled after coordinating with school authorities. The class teachers were requested to communicate to the parents with regard to obtaining signed informed consent before the scheduled visit. All parents were requested to be personally present on the day of examination. All eligible children were assembled in a hall and their height in inches and weight in kilograms were recorded by two calibrated investigators. Then, oral health status of the children was assessed using a predesigned oral health assessment proforma. It had three sections. The first section contained basic demographic details, the second section contained information on oral hygiene aids used and oral hygiene practices which were filled after discussing with parents by two trained investigators and the third section contained information on plaque and dental caries status. Plaque status was assessed using Sillness and Loe plaque Index. Simplified version with six index teeth in primary dentition was considered in view of children being very young and anticipating some degree of non-cooperation for prolonged clinical examination. The index teeth were 55 (primary maxillary right second molar), 52 (primary maxillary right lateral incisor), 64 (primary maxillary left first molar), 75 (primary mandibular left second molar), 72 (primary mandibular left lateral incisor), and 84 (primary mandibular right first molar). Dental caries was assessed using dft index (decayed and filled primary teeth, Grubbel 1944). Caries was diagnosed to be present if there was visible loss of tooth substance without the characteristics of a developmental defect and in pits and fissures when the point of the probe 'caught' upon gentle pressure. The assessment for plaque and dental caries was done by a trained and calibrated public health dentist using mouth mirror and explorer on a chair under adequate natural day light. Type 3 examination was used for assessing dental caries and plaque status. Mouth mirror, explorer and a torch were used for illumination of the area when the oral examination was carried out. Teeth were dried using a chip blower before examination was done for dental caries. The calibration of investigator for assessment of plaque and dft score was carried out on a group of 10 students in the department. All ten students were initially assessed for plaque and caries status by the investigator and data was recorded on the data sheet. Then, repeat examination of these children was done two hours after their baseline examination in the same visit. Participants in second examination were distributed in a different order. Cronbach's alpha for intra examiner reliability was found to be 0.87 and 0.98 for plaque and dft respectively. The body mass index of each subject was calculated and compared with age and gender using Center for Disease Control and Prevention (CDC) pediatric growth charts. Based on these growth charts, the sample population was distributed into three groups: Group I: Normal weight (5th–85th percentiles), Group II: Risk of overweight/obese (>85th percentile), and Group III: Underweight (<5th percentile). Data was analyzed using SPSS version 22 (IBM, Chicago). Quantitative data was presented as mean and standard deviation while qualitative data was expressed in frequencies and percentages. Plaque and caries status between the three categories was compared using one-way ANOVA and Tukey's post hoc test. 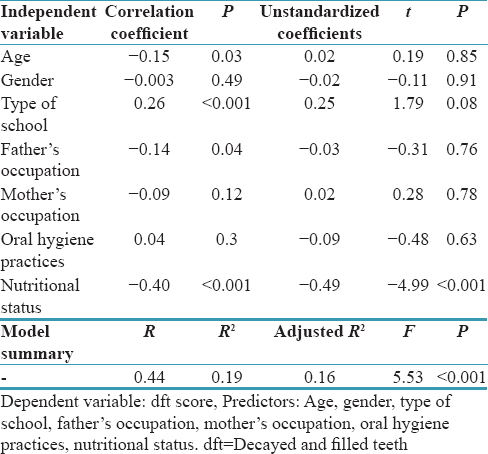 Pearson's correlation coefficient and simple linear regression were used to identify the association between age, gender, type of school, oral hygiene methods, the body mass index with plaque and caries status. Statistical significance was fixed at 0.05. A total of 171 children (89 males and 82 females) were included in the present study. Among them, 52 children were from government school, 59 were from private aided and 60 were from private unaided school. There was no significant difference in the age and gender distribution of school children in different schools [P = 0.36, [Table 1]. A significantly higher proportion of males in the present study were either malnourished (23.6%) or overweight (58.4) compared to females [P = 0.02, [Table 2]. Mean plaque score among school children in the present study was 1.4 ± 0.6. We found no significant difference in the mean plaque score between children in three different categories of nutritional status (P = 0.07). 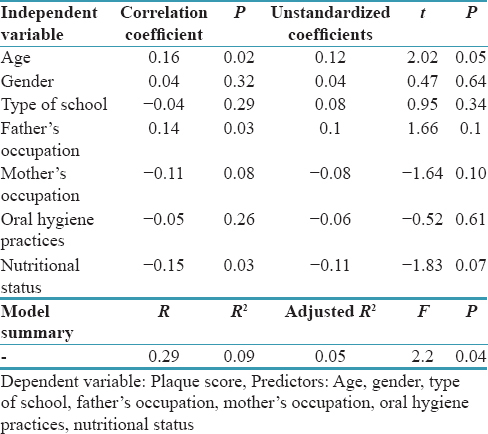 However, mean plaque score was significantly higher among children considered to be normal (1.4 ± 0.4) compared to those who were either malnourished (1.1 ± 0.7) or overweight (0.9 ± 0.4) when a separate analysis was carried out among children from private aided schools (P < 0.001). Mean decayed primary teeth among children was 0.8 ± 0.9. Mean decayed component was significantly higher among malnourished children (1.8 ± 0.9), followed by overweight (0.7 ± 0.8) and normal children (0.7 ± 0.8) (P = 0.001). Mean number of primary filled teeth in the study population was 0.3 ± 0.5. Mean filled component was significantly higher in malnourished children (0.5 ± 0.5) compared to children who were either normal (0.1 ± 0.3) or overweight (0.3 ± 0.6) (P = 0.001). 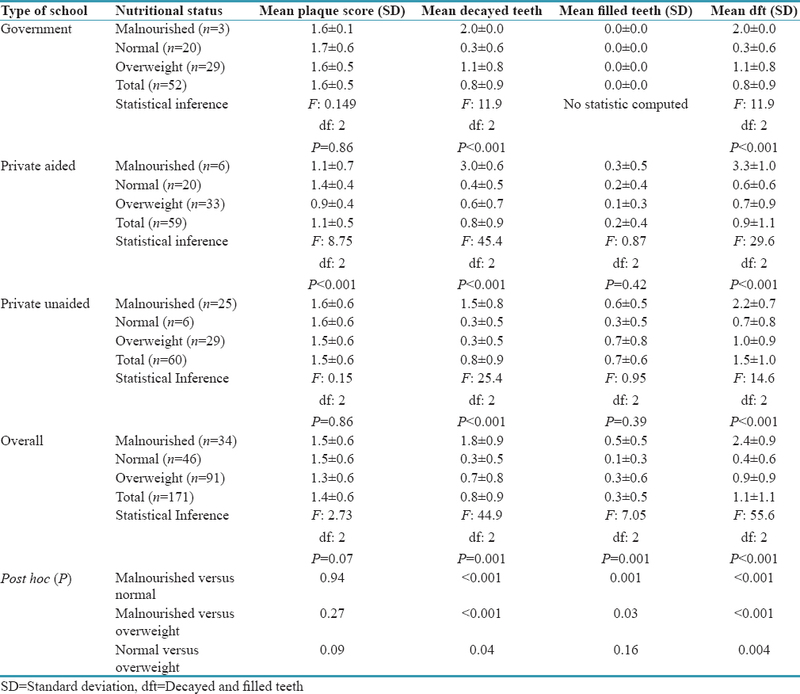 Mean dft among primary teeth was 1.1 ± 1.1 with a significantly higher score among children who were malnourished (2.4 ± 0.9) compared to children who were overweight (0.9 ± 0.9) and normal (0.4 ± 0.6) [P < 0.001, [Table 3]. Prevalence of dental caries among children in the present study was 62%. Prevalence of dental caries was significantly higher among malnourished children (100%) compared to children considered to be normal (37%) and overweight, (60.4%) [P < 0.001, [Table 4]]. Among age, gender, type of school, father's occupation, mother's occupation, oral hygiene habits and nutritional status. Only age was significant predictor of plaque core (P = 0.05). 9% of variance in plaque score was explained by these factors [Table 5]. Among age, gender, type of school, father's occupation, mother's occupation, oral hygiene habits and nutritional status. Only nutritional status was a significant predictor of dft core (P < 0.001). 19% of variance in dft score was explained by these factors [Table 6]. Malnutrition is multifactorial, having an early onset. It may occur during the intrauterine life or childhood, or at a later stage due to poor nutrition. Malnutrition is reported to exert multiple effects on oral tissues and onset of oral diseases. It affects development progression of oral diseases through an altered tissue homeostasis, a reduced resistance to the microbial biofilms and a reduced tissue repair capacity. Deficiencies of vitamin A and D and protein energy malnutrition (PEM) have been proposed to induce enamel hypoplasia. Development of caries requires sugars, bacteria, tooth susceptibility, bacterial profile, quantity and quality of saliva, and duration for which fermentable carbohydrates are available to bacteria. This study assessed the association between body mass index as indicator of nutritional status with plaque and caries status among elementary school children in Telangana. Study found no significant difference in mean plaque score among participants classified into malnourished, normal and overweight highlighting the fact that plaque score depends more on oral hygiene than nutritional status. However, mean dft was significantly higher among participants who were malnourished compared to those who were overweight. Children with normal body mass index had the least caries experience. This clearly demonstrates that both malnourished and overweight children are at higher risk for dental caries. High caries experience among malnourished children could be hypoplastic teeth in them. Infante et al. found a positive association between linear enamel hypoplasia and caries experience in primary dentition among undernourished Guatemalan children. Another study among Indian children found moderate to severe PEM to be associated with reduced salivary flow, reduced buffering capacity, lower calcium levels, lower protein in stimulated saliva, and reduced agglutinating defense factors in unstimulated saliva. These salivary factors also could have contributed to high caries experience among malnourished children similar to the results of many other studies., Moreover, socioeconomic status is an important parameter that can be linked to both dental caries and nutritional status. Studies have shown dental caries to be significantly higher in low socio-economic status groups who also tend to have poor nutritional status and poor awareness towards oral health., A study by Shailee S et al. (2013) found a higher caries experience among children attending government schools., High caries experience among lower socioeconomic groups could be attributed to lack of awareness, affordability, or underutilization of dental care facilities. Consumption of junk food, mainly refined carbohydrates at frequent intervals, could have contributed to high caries risk among children who were overweight. Our results were in agreement with a study by Alswat et al. who found significant positive association between the body mass index and DMFT after controlling for potential confounders such as smoking and brushing habits. However, a systematic review by Silva AE did not find sufficient evidence on the association between obesity and dental caries. They concluded that the evidence did not clarify the possible role of diet and other possible effect modifiers on this association. This study assessed the relationship between body mass index and caries among elementary school children from three different school types which represent three different socio-economic strata. Simple regression analysis found the body mass index to be a significant predictor of caries. The study was conducted among children from three elementary schools. The sample size was too small to make all subgroup analysis meaningful. Moreover, frequency of sweet intake was not assessed in the present study along with fluoride exposure which can act as confounders. The study found the body mass index to be negatively associated with caries experience in primary dentition with no association with plaque scores. Overweight children with malnutrition had significantly higher caries experience compared to children with normal body mass index. This highlights the importance of maintaining proper nutritional status with appropriate dietary habits. Diet counseling aimed at motivating adoption of healthy food habits can become effective if adverse consequences of junk foods on nutritional imbalance are highlighted which could severely affect health and dental health adversely. We sincerely thank all the study participants and school authorities for their kind cooperation and at different stages of this project. Kumar A, Kamath VG, Kamath A, Rao CR, Pattanshetty S, Sagir A. Nutritional status assessment of under-five beneficiaries of integrated child development services program in rural Karnataka. AMJ 2010;3:495-8. Kandala NB, Madungu TP, Emina JB, Nzita KP, Cappuccio FP. Malnutrition among children under the age of five in the democratic republic of Congo (DRC): Does geographic location matter? BMC Public Health 2011;11:261. Psoter WJ, Reid BC, Katz RV. Malnutrition and dental caries: A review of the literature. Caries Res 2005;39:441-7. Muller O, Krawinkel M. Malnutrition and health in developing countries. Can Med Assoc J 2005;173:279-86. Yadav SS, Yadav ST, Mishra P, Mittal A, Kumar R, Singh J, et al. An epidemiological study of malnutrition among under five children of rural and urban Haryana. J Clin Diagn Res 2016;10:LC07-10. Bryce J, Coitinho D, Darnton-Hill I, Pelletier D, Pinstrup-Andersen P; Maternal and Child Undernutrition Study Group, et al. Maternal and child undernutrition: Effective action at national level. Lancet 2008;371:510-26. Sahu SK, Kumar SG, Bhat BV, Premarajan KC, Sarkar S, Roy G, et al. Malnutrition among under-five children in India and strategies for control. J Nat Sci Biol Med 2015;6:18-23. Agarwal A, Gupta SK, Sukumar R. Hyperparathyroidism and malnutrition with severe Vitamin D deficiency. World J Surg 2009;33:2303-13. Foster BL, Nociti FH Jr., Somerman MJ. The rachitic tooth. Endocr Rev 2014;35:1-34. Bener A, Al Darwish MS, Hoffmann GF. Vitamin D deficiency and risk of dental caries among young children: A public health problem. Indian J Oral Sci 2013;4:75-82. Hong L, Levy SM, Warren JJ, Broffitt B. Association between enamel hypoplasia and dental caries in primary second molars: A cohort study. Caries Res 2009;43:345-53. Park K. Health care of the community. In: Park's Text Book of Preventive and Social Medicine. 23rd ed. Jabalpur, India: M/s Banarsidas Bhanot Publishers; 2015. p. 890-917. Yen CE, Hu SW. Association between dental caries and obesity in preschool children. Eur J Paediatr Dent 2013;14:185-9. Willerhausen B, Blettner M, Kasaj A, Hohenfellner K. Association between body mass index and dental health in 1,290 children of elementary schools in a German city. Clin Oral Investig 2007;11:195-200. Norberg C, Hallström Stalin U, Matsson L, Thorngren-Jerneck K, Klingberg G. Body mass index (BMI) and dental caries in 5-year-old children from Southern Sweden. Community Dent Oral Epidemiol 2012;40:315-22. Sukhabogi JR, Shekar C, Hameed IA, Ramana I, Sandhu G. Oral health status among 12- and 15-year-old children from government and private schools in Hyderabad, Andhra Pradesh, India. Ann Med Health Sci Res 2014;4:S272-7. Löe H. The gingival index, the plaque index and the retention index systems. J Periodontol 1967;38:Suppl 6:610-6. Peter S. Indices in dental epidemiology. In: Preventive and Community Dentistry. 4th ed. New Delhi, India: Arya (Medi) Publishing House Pvt., Ltd.; 2009. p. 346-7. Using the BMI-for-age Growth Charts – Centers for Disease Control and Prevention. Available from: http://www.cdc.gov/nccdphp/dnpa/growthcharts/training/modules/module1/text/module1print.pdf. [Last accessed on 2017 Feb 17]. Thomaz EB, Cangussu MC, da Silva AA, Assis AM. Is malnutrition associated with crowding in permanent dentition? Int J Environ Res Public Health 2010;7:3531-44. Ehizele AO, Ojehanon PI, Akhionbare O. Nutrition and Oral health. J Postgrad Med 2009;11:76-82. Sheetal A, Hiremath VK, Patil AG, Sajjansetty S, Kumar SR. Malnutrition and its oral outcome – A review. J Clin Diagn Res 2013;7:178-80. Infante PF, Gillespie GM. Dental caries experience in the deciduous dentition of rural Guatemalan children ages 6 months to 7 years. J Dent Res 1976;55:951-7. Johansson I, Lenander-Lumikari M, Saellström AK. Saliva composition in Indian children with chronic protein-energy malnutrition. J Dent Res 1994;73:11-9. Alvarez JO, Caceda J, Woolley TW, Carley KW, Baiocchi N, Caravedo L, et al. A longitudinal study of dental caries in the primary teeth of children who suffered from infant malnutrition. J Dent Res 1993;72:1573-6. Chandra Shekar BR, Reddy CV, Manjunath BC, Suma S. Dental health awareness, attitude, oral health-related habits, and behaviors in relation to socio-economic factors among the municipal employees of Mysore city. Ann Trop Med Public Health 2011;4:99-106. Shailee F, Girish MS, Kapil RS, Nidhi P. Oral health status and treatment needs among 12- and 15-year-old government and private school children in Shimla city, Himachal Pradesh, India. J Int Soc Prev Community Dent 2013;3:44-50. Alswat K, Mohamed WS, Wahab MA, Aboelil AA. The association between body mass index and dental caries: Cross-sectional study. J Clin Med Res 2016;8:147-52. Silva AE, Menezes AM, Demarco FF, Vargas-Ferreira F, Peres MA. Obesity and dental caries: Systematic review. Rev Saude Publica 2013;47:799-812.